The horror themes of animal attacks when camping are quite prevalent in pop culture, prevailing through hundreds of movies, and culminating in the excellent The Edge featuring Anthony Hopkins. However, such themes and stories are highly exaggerated in order to excite the viewer. When it comes down to it, almost all negative encounters with wild animals can be prevented by using simple common sense measures. This short guide will help you allay such fears, so you can enjoy your brief break from the commotion of human civilization. But be sure to research the types of animals in the regions you will be camping to be thoroughly prepared. Sealed bags/containers for all your food supplies, as well as for toothbrushes, shampoos and toothpaste. Cougar — Also known as mountain lion, albeit much smaller and less aggressive than the African cat. Like all cats, agile cougars will stalk and pursue their prey if they deem them as a viable morsel. When it comes to humans it is very unlikely they will attack an adult human, or to put it in other words – the taller you are, the less likely is the chance. The chance of attack is further diminished if your group consists of at least two people. Bears – All bears are capable of killing a human, but they rarely do so. Such situations occur only if you take them by surprise, if you close off their escape route, if you get close to their cubs, or if the bear will perceive you as a competitor for the same food resource. Black bears are the least likely to engage in such violent encounters, while grizzly and polar bears are extremely dangerous. It is safe to say that grizzly and polar bears are the apex land predators and should be treated as such. The best strategy when dealing with them is avoidance and making noise so you do not surprise them. However, if you know that an encounter with a grizzly or polar bear is likely, you should be well armed, have your weapon ready and easily accessible, or at least have a bear spray at all times. Moose – Surprisingly, of all the animals, you may find that moose are the most difficult to deal with. This is due to the fact that they are highly territorial and stubborn. If you happen to unwittingly trespass into “their” area, they will take it as a challenge. Moose’ antlers are a lethal weapon, compounded by their massive size and bulk. Furthermore, because they are not as fast they will regularly choose the fight option, over flight. Deer and Elk – They will pose a similar antlered threat if they feel threatened, or if you get close to their calves. Bison — For such massive animals, it is not surprising that they cause twice as many injuries than grizzly bears. You must be familiar with the tradition of bulls being released onto the streets of Spain’s towns, rampaging and occasionally mowing someone down. The footage of someone getting gored and stomped is quite frequent at that time of the year, and this is exactly what you can expect with a violent encounter with a bison. Keep a long, safe distance from bison, at least 100 yards. After all, they graze in the open grouped up, so they are not difficult to avoid. Wolves and Coyotes – Although not as dangerous on their own, their primary survival strategy is hunting in packs. When combined with their cunning and persistence when they perceive you as a worthy prey, they will become exceedingly dangerous. Like cougars, they tend to stalk and debilitate, until you are rendered helpless and on the ground, which is when the entire pack will pounce on you. Don’t run – every single one of the animals is faster than a bipedal human. With bears, wolves, and cougars, running will trigger their prey response, as they will then view you as weak takedown target. The only exception is the encounter with a moose – they still might chase you, but not very far. Bison is also faster than you, so when they charge, you should seek cover or climb a tree. Make noise, don’t crouch, and avoid direct eye contact. Try to back away slowly, without turning your back. When an attack with a wild animal occurs you will quickly find that your evolutionary instincts will awaken with great ferocity. Your adrenaline will skyrocket, helping speed up your reaction time and strength. In an ideal situation, you would want to use a handgun which is much more effectively wielded and aimed than a long range rifle. Using pepper spray would be the next best choice. If you have neither, your fingers would be your best weapon as you try to gouge the animals’ eyes. In case of an encounter with an antlered animal or a bison this may not be possible, so if you can’t get to cover, climb a tree, use rocks or branches, your best bet would be to curl in a fetal position, in order to avoid the most grievous injuries. Secure all of your food supplies in a tight container that doesn’t allow for the food smell to get out. Wash all the cooking utensils and pans before and after each use. This is especially helpful when dealing with rodents, as they will turn up for tiny food scraps. Try to not eat inside your tent. This will cause the food smell to linger inside, instead of dissipating in the open. Don’t leave any of the supplies outside of the tent. 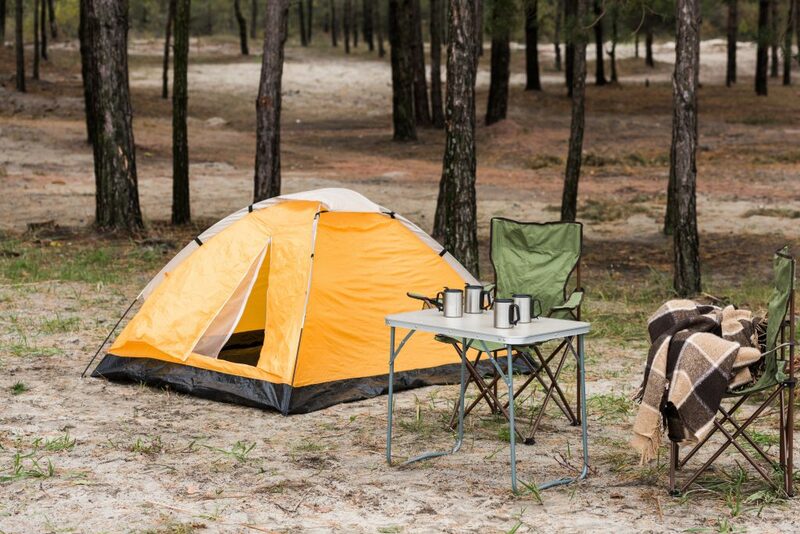 Clean your campsite, and bring odor-proof trash bags. Avoid applying unnatural smells like deodorants and perfumes, as they will surely attract unwelcome visitors. The most dangerous animals, like bears and wolves, have an acute sense of smell. In order to avoid attracting them avoid cooking altogether and opt for food you can eat without further preparation. Especially try to avoid cooking meat. After dealing with food or trash, always make sure to clean your hands thoroughly. Keep in mind to never have food smell lingering on your person, or in your tent. Fabric softener sheets have a repellent effect on most animals and can hide the food smell.